LTH Home > Chat > Beyond Chicagoland > Rochester, MN? For Barbecue try John Hardy's. Comes highly recommended by my compatriots at Roadfood.com. If 'Que is your thing then by all means avoid Roscoe's Root Beer and Ribs. Medicority at its best! I drove right through Rochester on Wednesday on my way to La Crosse. What did I do? I wanted a cup of coffee so I stopped at a McDonalds drive thru and in a weak moment ordered a Big Mac out of curiosity because I probably hadn't had one in over 20 years. That's what happens when you read a message thread as to whether they are grilled or not. Well, it will be another 20 years if then because it was the soggiest mess of a tasteless hamburger I can remember. They cannot possibly be grilled anymore can they? I can and will be able to in the future tell you more about La Crosse. I had an excellent dinner there at Kate's on State deli. Mostly, we stuck with Jasper's Alsatian (and bakery). The Bosnian place in the mall had very good cevapcici. Let me emphasize cautions made to me to avoid anyplace marketed to clinic patients and all pizza and Chinese. Bilotti's Pizza, 1st Ave. and 3rd St. Good, cheap pizza and other Italian entrees. If you're in Rochester because you have to visit the Clinic for medical reasons, it almost makes the trip worth it. When Clinic visitors are limited to restaurants in the immediate area, here are a couple that we enjoy. 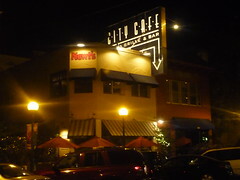 Mac's Cafe is in the mall area across from Barnes and Noble. It is a Greek diner-type place serving breakfast, lunch and dinner. We've mostly had their breakfast food - at any time of day. Blueberry pancakes are moist and have just the right amount of plump berries. Eggs are prepared exactly as requested and they make a nice crunchy hash brown. I've never tried the Greek menu items, but observed customers speaking Greek to the owner or manager (?) during my visit last week. 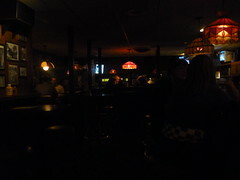 City Grill and Bar has an upbeat bar upstairs. Always a nice amount of people, noisy in a positive way - not too noisy to talk. Popcorn when you are seated with juicy burgers and fries. This is our go to place after receiving good news at the Clinic. FWIW, if you are in Rochester visiting the Mayo Clinic and you find yourself unable to leave the facility at mealtime, for whatever reason, you will find that the food in the cafeteria is pretty good by hospital cafeteria standards. I wouldnt wish hospital food on anyone, but like everything else at the Mayo Clinic their cafeteria is the best in the business. My fiance is from Rochester, so we've asked ourselves this question many, many times while visiting family. There are actually quite a few good restaurants in Rochester. Those doctors have to eat somewhere! Prescott's (http://www.prescottsgrill.com) is a chef-owned place--in a strip mall of all places (the chef said it's a terrific location-hundreds of parking spots!). It's housed in an old Bruegger's Bagels, and you can tell. But if you can get past that, you're in for a great meal. The menu isn't anything earth-shattering; it has pretty straightforward dishes like crab-stuffed chicken breast, tomato-basil soup a chipotle chile pasta. But it's all done really well, and there's just something about the place that makes you want to root for it. Probably because it's a chef and his wife running the place every day, and not another chain. We've enjoyed Redwood Room in the past--nice atmosphere, tasty pastas--but the heart evident in the food at Prescott's takes us there more often than any other place. I guess even local "chains" have their stigmas. After stopping in Brookings, SD for lunch we pushed on into Minnesota and took US Route 14 thru a few towns with a stop in New Ulm. Has anyone been to this little heavily influenced German Bohemian town? It's the home to Schell's Brewing Company and let it be known throughout signs around town that they are the Polka capitol of the nation. Quite a few bars for a town of about 15,000 in the main street area which was rocking the Friday we drove thru with the twins game on and great weather. Next year I plan on going to both La Crosse, WI and New Ulm, MN Oktoberfests. Stopped in one of the older bars for a boot brew and wanted to just stay there the night and explore the town but we kept it moving and went to Rochester. Another place I had never been that was more than I thought it would be. With the Mayo clinic, IBM building and university along with a population of 100,000+ I was quite pleased with it and happy to be staying there that Friday night. We stayed downtown which is near the clinic and really well taken care of and vibrant and alive on the Weekends, especially the night we were there, people were out. We took a stroll around town and stopped in for drinks at some bars and are options were Greek from this cafeteria like spot, Italian from a higher end restaurant and bar food with some Irish dishes from a newly built pub themed bar that was jam packed and fit 3 or 400 people and also Newt's. Which as was pointed out by girl was the only place in Rochester mentioned in Minnesota Magazines best burgers in the state and has been the locals favorite burger basically since it opened in 1980. Its a bar/restaurant housed on the 2nd level of a building complex, you walk thru the outdoor dining area of another restaurant and into the back and then up some stairs and into Newt's. I really liked the place upon my entry, it was dimly lit and had groups of people throughout at the tables that were out enjoying the start of the weekend and it had a really nice vibe inside. They had tables with stools and a nice bar section which is where we sat to take a look at the menu. The burger in itself was enough to get me there but then when she read me off the iPhone that they make everything fresh including the fresh ground beef, everchanging homemade soups, fresh baked breads on site and everything fried is hand dipped including the mozz stix, chicken sandwich and fish and chips and I was really sold. Along with all this they have a nice tap beer list and a really chill and funny bartender, my type of place. 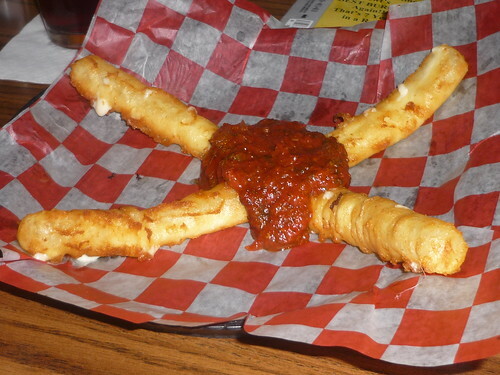 We started of with a small order of the mozzarella sticks, something I usually never get since they're all the same. Best I have had and although that's not saying much since they're all frozen, I would eat mozz stix more often if they were all fresh cut and hand battered like these. Next up was the burger. They had a nice selection of different options and I had my eye on the Todd Burger which was with bacon and two fried eggs. So after asking what was the most popular and the bartender telling me it was that one, that's what I got. Remember the beef is ground fresh, the burger is hand patted and cooked to your request, meaning it's a nice size and it goes on a fresh homemade bun which is buttered and then grilled. Imagine if a burger from Patty's had children with a hamburger from Kuma's. 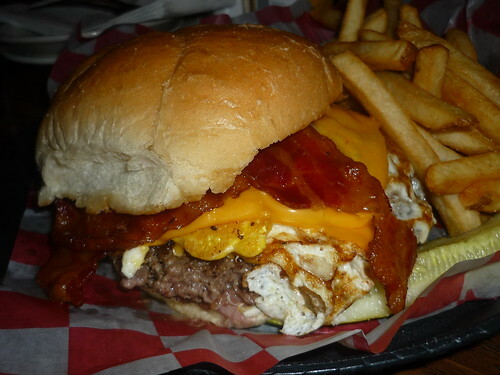 A burger from Newt's is the hybrid offspring. Just a fantastic bar burger with the beef and bun being top notch and then the bacon was cooked to a perfect crispness. One of the best burgers I've had all year. So if your ever in the area and want a burger and beer this is most definitely your spot. Looks like a great time! Wish I had this as a resource a few years back when I visited a friend at the clinic. That Burger looks awesome! I have the pleasure(?????) of spending 3 to 4 days there every six months or so with a friend. Breakfast is usually at the Canadian Honker, I try to eat enough so that i can skip lunch and just have to figure out dinner. The good choices are few and far between. I do like Newts but seeing as it is on the second floor and not at all handicap accesable, its out of the question. Dinner is usually at The Green Mill, not that it is so great, but not the worst and there are some bad places to eat there. Avoid pizza at all costs. It is amazing that a place of such renowned healing would be so poorly served foodwise. On a side note. The art collection the Mayo has is worth a side trip. Warhol's in the basement and a Chihuly hanging in the lobby. Every floor and many of the rooms have great art in them. They have a very good photography collection. I am planning an anniversary dinner for my folks in October. I have calls in to several restaurants. (Chesters, Terza, Grand Rounds) I would prefer a private room if possible so we can celebrate their 60th and hear each other. Also, we have a couple meat/potato people who won't be up for adventurous eats. I haven't seen any recent information here on Rochester. I grew up there, but when I visit, we eat at Mom and Dad's. Thanks for any ideas! Pescara. Primarily seafood but does have beef and chops. They are worth checking out. We ate 3-4 meals and they were outstanding, Fish was fesh, well cooked. We are dinner at least twice and fot lunch we had their fish tacos which were outstanding. Well worth checking out. I recently needed some major surgery and was referred to IN University Hospital. Leading up to the surget I considered going to Mayo because of Pescara. Not enough time to make arrangements, seriousness of surgery, and distance/cost prevented the change.